When I was a child I was always told your teeth turn yellow if you're a smoker so for a while I thought only smokers could get yellow teeth but boy was I wrong! Teeth naturally yellow with age due to different foods that can stain teeth and more so it is almost unavoidable. I've tried a whitening toothpaste in the past but I didn't like it because it left my teeth feeling overly sensitive so I was turned away from whitening products and didn't really want to look into an actual gel because I was afraid of what it might do to my teeth. 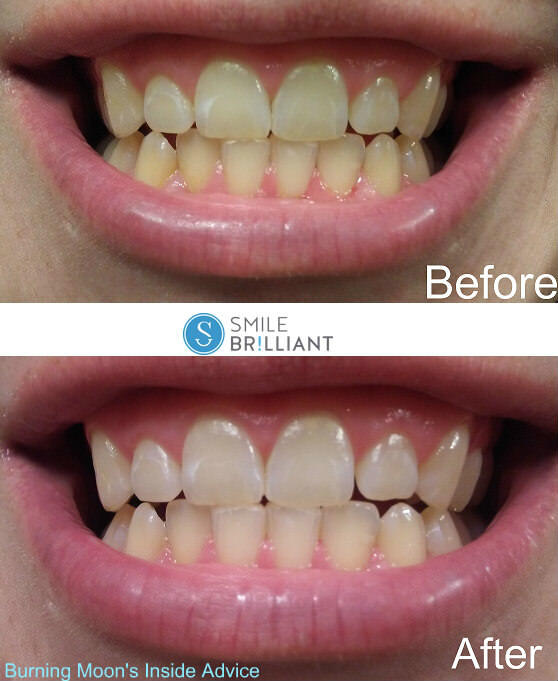 I was recently offered the opportunity to work with Smile Brilliant on a review of their whitening kit. I was hesitant at first but after speaking with their rep I was assured that even with my past experience of teeth sensitivity that my teeth would be fine using this kit so I agreed and looked forward to using the kit. I was told beforehand that some spots may not come out depending on past dental treatments, for example I had braces in middle school and once they were removed I had a few extra white spots around where the braces sat and no matter what they have always been whiter than the rest of my tooth so I didn't expect them to vanish. The kit I received had six whitening gel applications and six desensitizing gels along with a impressions kit and a pre-paid envelope to send my impressions back so they could make me a custom try. Their smallest kit comes with nine whitening applications for $139 which may seem like a lot because there are only nine applications but don't be fooled, depending on if you put the right amount each application syringe will get you 2-4 uses. I found the impression process very easy and it isn't like the impression gel they used when I had to get a retainer so I didn't feel like I was going to choke on it. After I made an impression of my teeth I had to fill out a little card, pop everything in the mail then I waited about a week and a half to get my custom trays back. The custom trays came with a container to hold them and everything fit snuggly on my teeth, the impressions were perfect. Applying the gel to the trays was simple and the instructions were easy to follow, you can use the whitening gel for anywhere from 30 mins to three hours depending on your preference, how much your teeth need to whiten and what you have planned (it is best to do this before bed). I found my gums felt a little odd at first when using this but I didn't have any burning or uncomfortable pings while using this. After you use the gel you rinse your mouth out, dry your trays and then use the desensitizing gel for 30 mins to an hour, the second step did not have any effect on my gums but I did note that it tasted pretty bad. Both processes will cause your mouth to water which is also why it is a great reason to do this before bed so that you can be close to somewhere if you need to spit. They say to try not to swallow the gels so I made sure not to swallow anything and I used it before bed so I didn't risk eating right away after using this. As I mentioned before you can get several uses out of just one applicator syringe, I managed to get four uses from one syringe with enough left for another half use. I found the trays to be a bit difficult to dry between uses so I wish I had bought a second tray set, if you purchase this I recommend doing so. I did not notice any sensitivity during. I did have a small freak out after the first use because when I took my tray off it looked like I had a few streaky chalk white spots, so I did the only logical thing and I looked it up. I found that it is called decalcification and it is a very common concern but it is something that occurs naturally in your tooth, once you use the second stage gel and let your saliva sit on the spots it will be gone when you wake up in the morning. Over all I think this was a fantastic kit and completely worth the price, my husband and family members noticed a bit of a different and so did I. Results will vary for everyone depending on your level of stains and what your natural white is, so I wasn't expecting pure white teeth and I wasn't sure if it would work either so I am very pleased with my results. Want to get a kit of your own? Use coupon code burningmoon20 to get 20% off your kit. Want to win a kit of your own? Click on the link above and you will be taken to the smile brilliant website to win a kit of your own.The giveaway is for a $149 Smile Brilliant credit. It is open for 1 week (7 days after blog post date) and open to USA, UK, Australia and Canadian residents. It looks like it's working well. I also get nervous about using teeth whitening systems too much because I've seen some people who have clear teeth. That would be kind of crazy to see, I wonder how often they use it to get that kind of effect? This kit is designed not to over whiten it is only supposed to help you get to your natural white. Oh my, I could see the difference just by looking at the photo, the product has done such a great job. This looks great. You can really see the difference too so it is definitely something worth trying for sure! Awesome item! I'd love to have shiny white teeth, too so I hope to win! Chewy.com - Greenies Dental Treats Review! LED pool games - Starlux Games Review! Father's Day Rock Star Handprint Tutorial! Dolphinaris AZ Land Experience Review!